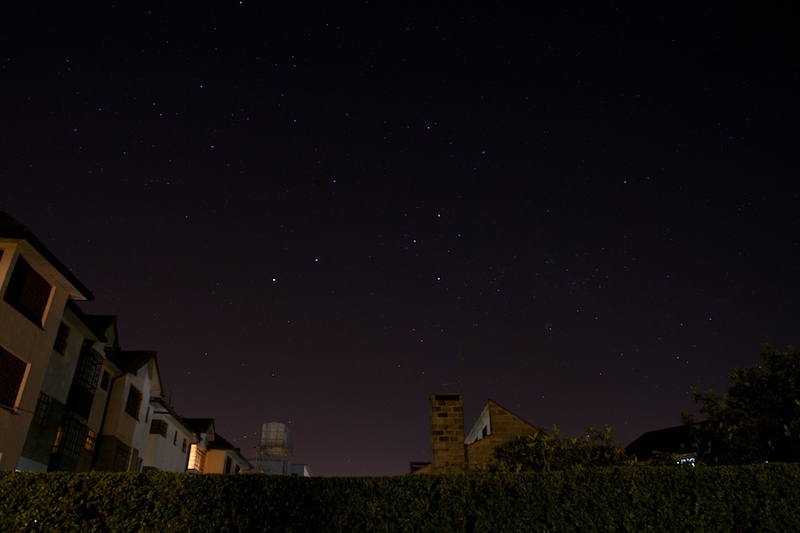 Walked out our front door last evening to find clear skies over Nairobi. Zach and I set up the camera for a long exposure and captured a bit of the beauty. Center in the photo is the Southern Cross, a constellation unique to the southern hemisphere, and one of those tell-tale signs that we are vary far from New Jersey. Most people probably don’t realize that the night sky looks different from different places on the globe. Most Kenyans have never seen the North Star; most North Americans, the southern sky in this photo. Even if you don’t usually pay much attention to the stars, you would notice something amiss if you happened to be transported far over the equator and glanced upward. It would feel foreign even if you didn’t know why. I remember flying home after our first three years in Africa. As the airplane began its approach into Newark, New Jersey, I looked out the cabin window and was surprised by the Big Dipper set brightly in the night sky. It was the first sight of “home” I had in a long while. These days, however, that cross is what I hope to see when I look up.